Welp, today is take your dog to work day. Since I have the day off work (or the unpaid PA school internship I like to refer to as work) I came to Dallas to spend my three day weekend with the dudes. My day of work may or may not involve laying out at the pool, shopping for wedding shoes, and finishing the Maze Runner series. 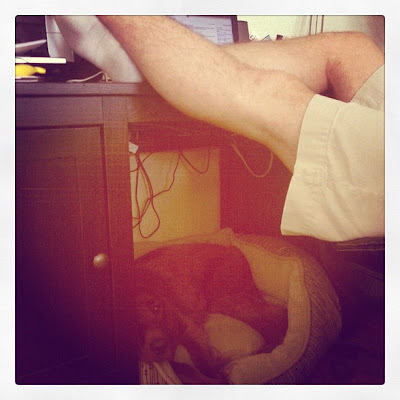 Sometimes Josh gets to work from home, which is extra convenient on this year's Take Your Dog to Work Day. Were any of you brave enough to take your pups to work? Today she is here because one of my coworkers is watching her for us for the next few days while we are out of town. She has 2 kids that LOVE Taylor so I know she will come back spoiled rotten. I don't think my employer would allow this. I might just have to look for a new job ... this is all I want in life! to be able to take my dog to work ... even if just for one day. I wish my dogs could come to work with me!!! They sometimes go with M.
Enjoy the boys for the weekend!! That's so cute! I want a dog so I can take him/her to work! Ah. If only I could bring our dogs to work. But it's a restaurant. I could bring them... but I wouldn't have work the next day.